This is a great Summertime Treat! My family enjoys it very much and it's easy to make. Enjoy!! If you use fresh strawberries, cut in half, put in bowl and sprinkle small amount of sugar over them. Let stand at room tempersture for an hour or so. If using frozen, thaw and add when jello has cooled. Add whipped topping and strawberries to the jello. Mix well and pour into the crust. Refrigerate for a little while before cutting. Garnish with sliced strawberries if desired. My kids and I love this. We make it for every holiday now. Easy too! I'm 41 today and I remember my mom making this pie when I was 10 years old. I was reminiscing about it and just had to see if anyone still had this recipe. You know it's delicious when it brings back memories from 31 years ago! My mom would make this every summer. Cool and light, great for hot summer days. You don't have to use the fruit. I made it a few days ago using raspberry jello, just as yummy. Give it a try. Easy to make, delicious to eat! This pie is a "no fail" pleasure. I've tried different flavors of Jello and love them all.. (with lemon jello you may want to use a bit of food coloring).. but other than that.. its the bomb! And if you're watching your figure,, hey, its Jello..! I love Strawberries Jell-O Pie better than regular of strawberries pie because of glaze made me sick from too thick of sugars and too much work for chewable into my mouth as long whip is best for me feel long taste. Reviewer: Marcos the Jello Pie Lover! MY grandmother made this pie for her Pastors Aid, ladies lunchen every summer! It's a part of my childhood I love! This recipe reminds me of my childhood. It's also one of my favorite desserts besides key lime pie. Thank you for bringing back the memories of summer and fun! I lightened the recipe up a bit since I'm on Weight Watchers and it was great. Thank so much for the recipe! Made this a long time ago but forgot recipe since kids grew up. Now making for my grandsons. It works well with orange jello also if some don't like strawberry. I have one grandson who is a Creamsicle-flavor addict and loves it. Easy to prepare and very good to eat. I also added a little lemon juice. Excellent summer desert. I just shared the recipe with my son. Makes a very good pie. I put a twist on it and omitted the chopped berries in the pie. 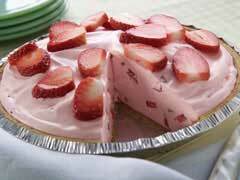 I covered the top with fresh sliced strawberries instead. I covered the top of the pie and berries with Marzetti glaze for strawberries. I will try this. I have had other flavors and loved it, but I really do love strawberry so I am looking forward to it. This is surely an excellent dessert. My favorite's made with salmonberries (AKA cloudberries) with orange flavored jell-o. I found the recipe that I have been looking for! I make this for my family all the time, and we all LOVE it! I've even started to venture out and use different flavors. Its easy to make and taste good. Ive been making this pie since my oldest was 4 years old! He is now 32. The kids always beg me to make it, and so here I go Christmas pie! it is so awesome, it didn't take much begging !! Love this pie. So simple and delicious. Can't wait to try other flavors. Thinking maybe lime. I MAKE THIS A LOT FOR FAMILY GET TOGETHERS EVERYBODY LOVES IT, I NEVER TAKE HOME ANY LEFTOVERS.